I’ll be the first to admit it – Hi-Fi+ has covered a lot of AURALiC products in recent years. Even though this is my first review of the brand’s products, practically every product the company has made has found its way onto the pages of this magazine. Having had no direct personal experience of the product (save for brief exposure at shows) and seeing every other reviewer who touches the product seemingly turning into a swivel-eyed loon for the brand, I thought it time to wave around some Editorial privilege. What is AURALiC’s magic trick? 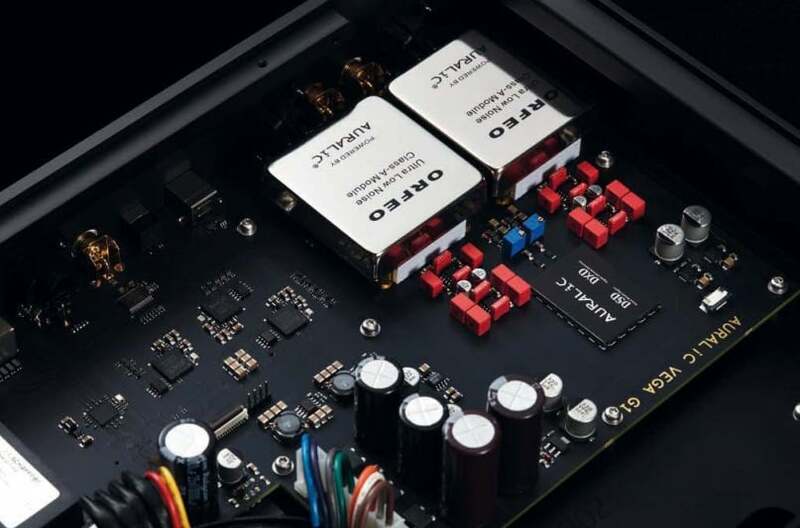 Our most recent review combined the VEGA G2 streaming DAC with the new LEO GX clock in Issue 164. OK, calling the LEO GX a ‘clock’ is editorial understatement on a grand scale, but this review piqued my interest on a couple of levels. Most notably, however, the G2 review fascinated because of the existence of the VEGA G1 tested here. You see, at first glance, both on paper and in the flesh, the differences between the G1 and G2 are minimal in everything but price. Scratch the surface of course and things begin to look a bit different. But how different in the real world and do those differences matter… those were the questions that made me call for the AURALiC VEGA G1. The most obvious visual difference between the two players is the move from a black knob in the G2 to a silver one in the G1. Things get clearer cut to the rear of the two because the G2 features a pair of AURALiC’s own Lightning connectors, a clock input and a set of stereo RCA sockets for an analogue line input – all of which are absent in the more pared-back G1. The cases, however, are noticeably different (at least when placed side-by-side). They are the same size and weight, but the G2 uses AURALiC’s Unity chassis hewn out of a single piece of aluminium, and this sits on special sprung feet. While the G1 uses the same grade of aluminium, the cabinet is made of piece parts bolted together, and sits on plastic feet without the springy suspension system. Really close visual inspection shows these differences, and at each point, everything suggests the G2 is better. This is a subtle but important distinction, akin to good tailoring; the G1 is like a well-cut made to measure suit you might wear to nail that interview, but the G2 is that bespoke Savile Row suit in which you got married. ► that the G1 uses its own custom analogue volume control, where the G2 uses the chipset’s internal digital volume, and the absence of galvanic isolation across the rear connections. These are fairly significant changes and are best thought of as being in the order of magnitude of the difference between a 12 and an 18 year old single malt! The absence of Lightning Link connectors also makes using the ARIES models to create a full ‘belt and braces’ Lightning Server system slightly less ‘plug and play’, and you miss out on some of the ‘Rolls-Royce’ elements of the AURALiC streaming system (file sampling rates, for example). However, what’s great is more what the two share rather than what they lack: the G1 and G2 both use AURALiC’s Tesla digital platform, and both can utilise the Lightning DS app that controls everything AURALiC. Tesla is the core processing engine, built around a Quad-Core A9 chip, 1GB of memory, and 4GB of storage. Put simply, the two share much of the same circuitry… there’s just more of it in the G2. Wireless connectivity (such as AirPlay and Bluetooth) are not supported. The G1 is no slouch though. It uses the company’s own Orfeo Class A modules; these are operational amplifiers inspired by Rupert Neve’s 8078 analogue mixing console circuit design – a design considered by many in the recording studio world a console sans pareil. An audio product that features output stages that attempt to recreate that circuit put AURALiC up there with the best. In the light of the bigger, better G2, why should the VEGA G1 be so interesting? Because the VEGA G1 just might occupy the perfect sweet-spot for this-and-the-next generation audio. The G2, for all it’s sonic and technical prowess, is higher in cost because it’s more demanding to build. It not only has room for growth (with the LEO GX), but there is almost an expectation in the owner of a VEGA G2 that it’s the first step on the big AURALiC ladder. The G1 places no such demands on the user or the system, and that is its genius. I’ve stayed clear of describing the processes involved in hooking up a network device recently; not because they are difficult (if anything, building a home network for audio is becoming easier by the day), but because people get the wrong idea. They see the process in terms of a number of steps and get concerned and start comparing the process (unfavourably) to playing a CD. However, if you break anything down into its individual steps, the task becomes impossibly daunting: making toast, for example, is a process so complicated that it should only be performed by trained experts. And AURALiC is at the pinnacle of that next- generation technology – using it is actually absurdly simple when set up, but people see those three words and spiral. So, here’s the deal. The VEGA G1 is the product for those spiralling digital users. Beyond its use as a streaming device, it is – first and foremost – a damn good DAC. Use it with a CD and you’ll get great sound… and a pathway into today’s online and local streaming when you are ready. ► the important genetic code of its bigger brother, and most of what isn’t on board isn’t vital for many users. Granted a G2 is better, but many staring down the difference between ‘three and a quarter grand’ and ‘five and a half grand’ will be unable to make that jump. Sure, AURALiC’s Lightning Server technology, the better chassis, the proper analogue volume control, and the ability to hook this to the full Bridge-Streamer- Clock system of the G2 range all cut into functionality, but they all add up, too. This gets you most of the way there in terms of tech and spec and sound for a fraction of the cost, and that makes the VEGA G1 really important. It’s important enough that if I were one of the big names in this field, I’d be worried about this product. Worried not just because it’s got a great spec, but more because it actually sounds really good. I mentioned the absence of Lightning connectors, but the G1 is entirely supported by the Lightning DS app, and this is an excellent interface, especially if used with Roon (the G1 is Roon Ready), Tidal, and especially Qobuz Studio. While a lot of listening was done through my local server through my wired network, a good deal was made online, and both through the Lightning DS app. This works seamlessly both with the online services and in controlling the G1. Configuration and installation is fuss free so long as your network is pretty robust and your computer hardware isn’t so old that it’s programmed in Latin. Put it this way, if you know what a NAS is, have one, and configured it yourself without having to reach for a fire extinguisher, you’re probably over- qualified to install the G1. I’m saving the best until last here, and that best is the sound you get from the G1. I’m not that troubled by the digital volume control because for most of the test, I ‘dimed’ the volume control and ran it into a system, rather than use it as a preamp in its own right. The volume control itself was mostly used in the context of working the G1 as a headphone amp. More on that later. ► from the Malibu album [ArtClub]. This is a great rap track with an excellent bass line but is often undermined by the thinness and compression inherent to the recording. The G1 does not try to compensate for that compression; it just gives you so much information, and so much musical enjoyment along with that information, you just don’t care. You listen to that fine guitar sound, the really tight hi-hat work, and the chorus schoolyard rapping, and the distorted playing of the Israeli national anthem, Hatikvah, throughout the track… and it makes you move and smile. It’s a pity in a way that the track is so thinly recorded, because it has an excellent bass line, and bass is perhaps what the G1 does best. That… and all the other things it does best too! Bass is definitely the G1 ’s most impressive weapon in its musical arsenal. Here, I moved between classical and rock; I’m playing Beethoven’s ‘Ode To Joy’ from the Ninth Symphony [Von Karajan, Berlin Phil, DG] like it’s going out of fashion at the moment and the G1 conveys all the energy and drive of that piece, along with the majesty of the timpani and choir, leading up to that monumental crescendo. The G1 allows the music freedom to really give it some beans, and you find yourself playing it at Def Con 1 levels, air conducting as the windows shake… five doors away. Meanwhile, moving over to Jeff Wayne’s Musical Version of the War of the Worlds [Columbia] is truly fascinating. Not only does the resonance of Richard Burton’s voice shine through, but the G1 is also detailed enough to highlight just exactly how drunk he is on each take. The combination of his stentorian (and mostly half-cut) tones coupled with some really chunky analogue voltage- controlled oscillator drift from some bat-crazy synthesiser sounds showed the depth and the clarity of the VEGA G1 perfectly, and its inherent musicality shone through as this album led inexorably, tragically, to playing some Wakeman- era Yes, with even more drifty Moog synths. I’m not proud of that particular sojourn into widdly-wee prog, however! Finally, the G1 ’s headphone amplifier. To a certain extent AURALiC cut its teeth in the personal audio space, so perhaps it’s no surprise the VEGA G1 has an excellent headphone section, but perhaps what makes it so good is how well balanced and how well it tracks the sound quality through the line level outputs. Like those outputs, the VEGA G1 ’s headphone stage is dynamic, clean, detailed, and possessed of excellent bass; deep: powerful, pacey, and meaty. If there is a comment to be made here, it’s more a sin of omission – I’d love to see a balanced headphone output here in place of one of the two 6.35mm headphone jacks. The G1 not being a G2 only manifests in comparison. In day-to-day use, the VEGA G1 is an ideal network streaming device that puts many really good rival products to shame. It’s extremely well built, sounds exceptionally good, and plays nice with most products it’s likely to be hooked to. I started this investigation to see what all the fuss was about, and now I’m reading from the AURALiC Fanatic’s Handbook. The company really does live up to the hype, as anyone who gives the VEGA (G2 or G1) a serious listen will attest. In fact, they might well say one of the notes I made while listening to the AURALiC VEGA G1 – Bloody hell… this thing’s good!